I saw it advertised during Nascar but didn't think much about it, I told Kat. "Wait. Stop," she said. "Nascar? Since when do you watch Nascar?" Sheesh. I like to watch cars go around fast in a circle and all of a sudden I become suspect. Do you have to give notice to friends if you decide to watch Nascar? Does it somehow change who you are? These are questions I will leave to another post, because this one is about Johnny Sneed and politicians and high school - and the last time I saw Johnny Sneed. This is what I don't understand about myself. I cannot remember my password to online banking to save my life - but I remember that the last time I saw Johnny Sneed was at the Mississippi Coast Coliseum like two years after high school graduation. I had won tickets to some oldies revival concert. And when "Jeremiah was a Bullfrog" came on the whole crowd started dancing - and Johnny Sneed came up with a girl and said hello. He was tall. She was short. He said hello, gave me a quick hug and danced away. And now he's on TV. And he probably wouldn't even remember my name, much less the last time he saw me. Yet I can play the whole scene out in my head like it happened yesterday. HGTV is unveiling a flurry of one-hour specials and holiday episodes from Nov. 23 through Dec. 16. HGTV will also premiere its first holiday decorating special, Decked for the Holidays. Decked for the Holidays premieres Nov. 23 at 8 p.m. Gift Show 2007 premieres Nov. 25 at 8 p.m. Decorating Cents premieres Nov. 27 at 8 p.m.
24 Hour Design premieres Nov. 27 at 8:30 p.m.
Get It Together premieres Nov. 30 at 8 p.m.
What's With That Really Decked Out Christmas House? premieres Dec. 9 at 8 p.m.
Color Splash premieres Dec. 10 at 8 p.m.
Deserving Design premieres Dec. 12 at 8 p.m.
Design on a Dime premieres Dec. 12 at 8:30 p.m.
White House Christmas 2007 premiere Dec. 16 at 7:30 p.m.
Holiday Windows 2007 premieres Dec. 16 at 8 p.m.
Juliet Chung had an interesting article in the Wall Street Journal recently about the demise of the entertainment armoire (coupled with the rise of the flat-screen TV). But yours doesn't have to join the eBay and craigslist slushpile. She points to a recent episode of HGTV's Design on a Dime where Spencer Anderson turns an unused entertainment armoires into a computer workstation. Materials: A screw gun or Allen wrench, wooden clothing rod and two mounting cups (available at hardware stores), primer, paint, paintbrush and roller. Unscrew the TV shelf and slider and remove them. Cut the clothing rod down to size, or ask the hardware store to do it for you. Screw the mounting cups onto either side of the armoire's interior, then insert the rod into the cups. Prime the interior using a high-quality paintbrush to avoid leaving hair in the finish. Paint the interior, using a foam roller for a more uniform finish. Using a different color from the outside "can make the interior pop," says Mr. Anderson, who adds that black can look particularly elegant. Mr. Anderson also recommends using semigloss paint. Alton Brown and his motorcycle flavor-seekers are invading Mississippi for Feasting on Asphalt 2: The River Run. The group will make its way north from Baton Rouge into Mississippi for catfish, fried chicken and to see the birthplace of Coca-Cola. In episode 2, the flavor-seekers make stops at The Donut Shop in Natchez, Club 601 in Natchez, the Natchez State Park, Natchez Trace Parkway, The Old Country Store in Lorman, Biedenharn Candy Co. and The Coca-Cola Museum in Vicksburg and Jim's Cafe in Greenville. In episode 3, the gang's last stops in Mississippi will be Doe's Eat Place in Greenville and Joe's White Front Cafe in Greenville. They make stops in Barton, Ark., and Memphis for the rest of episode 3. A new episode airs at 8 p.m. each Saturday on Food Network. For more on Feasting on Asphalt, visit www.altonbrown.com or www.foodnetwork.com. A PBS project, tentatively titled The History of Television and set to debut in spring 2009, will comprise a series of programs examining every aspect of the medium. Kicking off the series will be a four-hour look at scripted primetime programming and the iconic characters featured in comedy and drama series during the past six decades. Ten stories - some true and some taken from episodes in the Scooby Doo canon. Can you sniff out the fact from fiction? Go ahead and tie up your ascot and hop aboard the Mystery Machine already. Virtual Scooby Snacks to anyone who gets 100%. Heinz Ketchup is sponsoring a Top This! 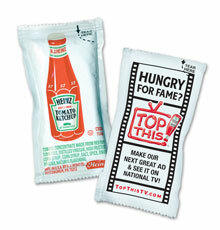 TV Challenge where consumers have until August 6 to create their own Heinz TV ad, upload it online and vote for favorites. They also created a custom YouTube site (where more than 1200 videos currently reside). Winning ads will be televised nationwide and the winner also receives $57,000 (of course). William Shatner has been tapped by the Biography Channel to do a new celebrity interview show. The new half-hour program, Shatner's Raw Nerve, will have him interviewing actors and politicians. It will explore "life's most intriguing questions and unearth his guests' strange and unknown stories." Thirteen episodes have been ordered and are set to run next year. According to reports from Integrated Media Measurement Inc., it's the kids who need to take the remote control away from their parents. New research has shown that older adults consume much more traditional media than younger adults. The biggest group - females 45-54 - will watch more TV, DVDs and theatrical releases than anyone else, estimated to be around 47.6 days, or 1,142 hours in 2007. Men 45-54 are the second-largest group. They will watch 40.2 days of media. The younger female group ages 35-44 come next, at 38.3 days. Middle-aged men ages 35-44 - the fourth-biggest group - are on pace to watch 33.9 days. Further down the list are teenagers 13-17, who will screen 33.35 days. That's 30% less than older woman, and 17% less than older men. "Blinded by the light, revved up like a ..." If you can complete that lyric, Fox may have a reality show for you this summer - Don't Forget the Lyrics! The show will premiere on July 11 and will continue in half-hour installments at 8:30 each night for several weeks. Wayne Brady will host. Contestants will sing along with the house band. When the song stops, the contestant has to finish the verse. After each successful completion, singers can either continue on or take a cash prize and leave. If the contestant can complete 10 lyrics, they'll win a $1 million prize.